This book is appropriate for both the computer science undergraduate course in 3D graphics programming using OpenGL and for professionals who are interested in mastering 3D graphics skills. It has been designed in a 4-color, "teach-yourself" format with numerous examples that the reader can run just as presented. 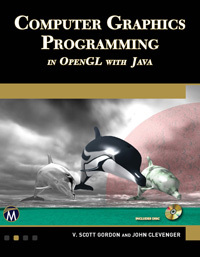 The book is unique because it teaches OpenGL programming in Java, using JOGL – a standard Java "wrapper" for OpenGL's native C calls. Includes companion files with all of the source code as well as the models, figures, textures, skyboxes, normal maps, etc. used throughout the book. Illustrates every technique with complete running code examples. Everything needed to install JOGL and run every example is provided. Includes every GLSL programmable pipeline stage (vertex, tessellation, geometry, and fragment) -- with examples. Underlying OpenGL C calls are always exposed – the reader learns them. 1: Getting Started. 2: JOGL and the OpenGL Graphics Pipeline. 3: Mathematical Foundations. 4: Managing 3D Graphics Data. 5: Texture Mapping. 6: 3D Models. 7: Lighting. 8: Shadows. 9: Sky and Backgrounds. 10: Enhancing Surface Detail. 11: Parametric Surfaces. 12: Tessellation. 13: Geometry Shaders. 14: Other Techniques. Index. V. Scott Gordon and John Clevenger are both computer science professors at California State University, Sacramento.